Our 1st day of traveling with my son Tom and his Family, I thought I would show them Cheaha State Park and let the kids have a chance to run about!! This is my buddy Justin and I. This is a roadside vista of the Talledega Forest in the scene!! Beautiful green forrest!! 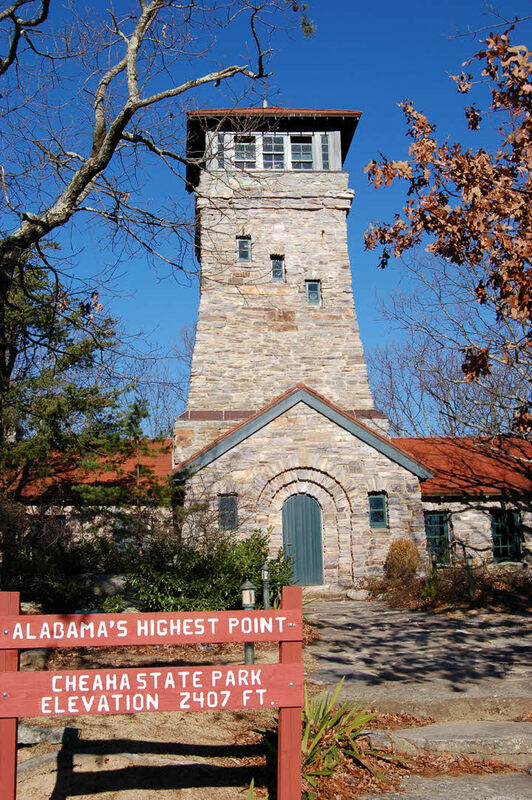 This is Bunker Tower, the highest point in Alabama. It is the 1st place we stopped in the Park!! Next we did go in and go to the top!! Here Chloe and Olivia are posing in the stairwell windows!! This is our traveling group! My wife Marlene, brother Reggie who had not seen the Park before. Chloe, Olivia, Justin, their Dad Tom Robershaw and I. Tom's wife Kim took the picture!! Afterwords we went to the resturant deck to check out the menu and views!! Looking out we could see the lake below and our curosity got the best of us, so off we went to check it out!! Here is grand daughter Chloe and brother Reggie and the rest of us climbing the stairs!! It just had small windows at the top to look out!! Well the lake was very nice!! The kids of course wanted to go swimming. My wife Marlene said if we ever came back, she wants to come there 1st!! It was a nice layout, nice restrooms for changing etc. There was a beach with shallow water for beginners and a deck in the deep water, with a tower for older folks and kids to jump off. But it was lunch time and back to the resturant!! It was very nice with a great view of the valley below!! Daughter-in-law Kim is finishing up with the girls! Click on the Pictures for Enlargement or Click on the Flag for the Next Page!! The music playing is by our cousin Bill Brown on the Love side of our Family! !